A refurbished house is the setting for farm-to-table dishes. 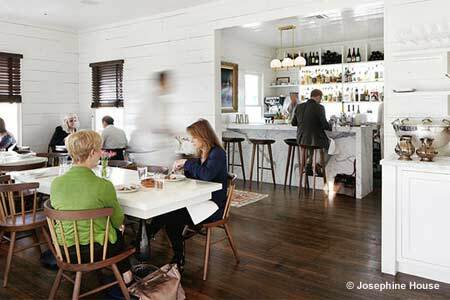 : Located in the Clarksville neighborhood of Austin, Josephine House offers visitors a unique dining experience with seating on the outdoor shaded patio, in the dining room and at the bar. The concise, farm-to-table menu includes lighter fare like tomato and melon gazpacho and also hearty hot-smoked pork chops with littleneck clams and sun-dried tomato broth. Selections change based on what’s in season. Our favorite dish at the last visit was a lightly seared halibut with a tomato and field pea salad, capers, smoked paprika aïoli and Cajun vinaigrette. As a cure for the Monday blahs, Josephine House offers a special three-course steak frites night, complete with four different steak variations. This is an equally popular weekend brunch spot, and we suggest the lemon ricotta pancakes with local peaches and house-made butter or the sweet potato and chicken sausage hash.